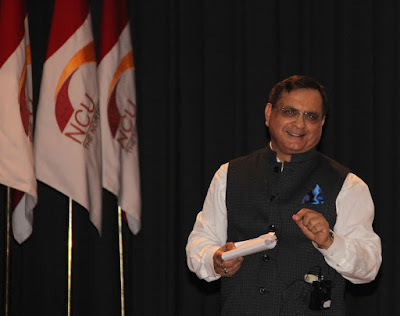 As part of the Induction Programme, Rtn Ranjan Dhingra, Former District Governor of Rotary International was invited to address the students on the topic ‘Service to Society’ on 24 July 2018. An engineer by profession and a successful entrepreneur, he was adjudged as the ‘Best Outstanding President’ of the year in the District and has received many awards. Rtn Ranjan Dhingra emphasized that success in life is important but being a part of society entails a moral obligation to give back to the society also. He drew analogies from stories of many successful persons in history including Alexander the Great, who built a large empire, yet died empty-handed. He encouraged students to try and bring a ‘smile’ on at least one person’s face, through their actions. Everyone should aspire to be an agent of social change and should not hesitate to take up new initiatives.